.The Chief Minister said that Shri Gadkari has opened the east coast of Mumbai to the common people. He said that the domestic and the international cruise terminals will create jobs and have a positive impact on development. Speaking of various transports modes such as water, coastal roads, monorail and metro rail, Shri Fadnavis said that the ticketing systems of these various modes will soon be integrated. 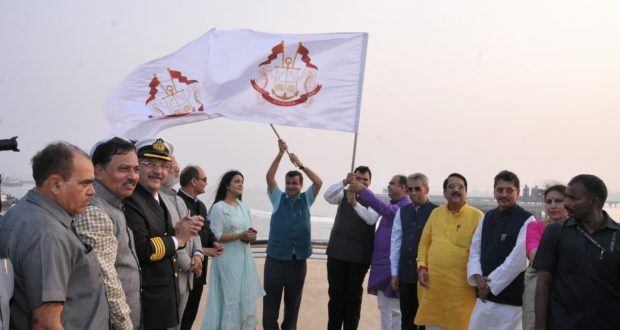 The Mumbai – Goa Cruise Service is India’s first luxury cruise liner. It would sail to Goa three days a week. It would give a new dimension to cruise services and help expand its horizons in Maharashtra, Gujarat, Karnataka and Kerala. The new terminal is centrally air-conditioned, with façade lighting. 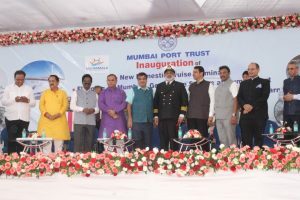 Mid-size cruise vessels with a carrying capacity of 300 – 400 passengers would be operated from Mumbai to Goa from the new terminal.Interacting with the media on board the maiden voyage of Angriya, the Union Minister Shri Gadkari said that 100 cruises such as this will be started, giving a boost to Mumbai Goa connectivity. He said that such services will be launched in rivers too. Water hotels will be set up along the Thane – Virar route. Water taxis will become operational for the new airport and for Panvel. He added that the Central Government is ready to build a jetty to facilitate water transport from Thane. A sea plane too is being planned, said the Minister. he Bhumi Pujan for the Reclamation at Jawahar Dweep for Tank Farm was also performed on the occasion. Under this project, excavated rock material from Metro Rail Project is being utilized by Mumbai Port for reclaiming 13 Ha. of land at Jawahar Dweep. The reclaimed land will be used for tank farm for storage of crude having capacity of 4.28 lakhs KL. The project is scheduled to be completed by October 2019. The project adopts an environment-friendly approach for reclamation. It will result in savings of 50 lakh km of truck movement through city roads and about 12 lakh litres of diesel for MMRCL, resulting in less pollution. For BPCL and HPCL, 16 tanks each of 26,800 tonnes capacity for storing crude oil will be provided through this. It will also result in shorter distance of pumping, faster vessel turnaround and would enable more effective use of storage tanks at refinery. The Bunkering facilities at Jawahar Dweep were also opened on the occasion. This is being done as the result of a tripartite agreement between BPCL, HPCL and Mumbai Port Trust. With the development of the Barge Handling Facility at Jawahar Dweep, Mumbai Port Trust has reinforced its identity as a Bunkering Hub, and is now geared up to meet a target bunker sales of 2.5 MMTPA by the year 2023.